Full length native protein (Purified haptoglobin types 1-1, 2-1, and 2-2 from pooled human plasma). Our Abpromise guarantee covers the use of ab13429 in the following tested applications. Uncleaved haptoglogin, also known as zonulin, plays a role in intestinal permeability, allowing intercellular tight junction disassembly, and controlling the equilibrium between tolerance and immunity to non-self antigens. Western blot - Anti-Haptoglobin antibody [HG-36] (ab13429)This image is courtesy of an anonymous Abreview. ab13429 used in Western Blot. Tissue lysate was obtained from HOPE-fixed paraffin-embedded blocks of human lung, lung cancer and liver tissue, loaded at 30µg/ml. ab13429 used at a 1/100 dilution. Secondary used was an alkaline phosphatase goat anti-mouse polyclonal used at a 1/10000 dilution. Immunocytochemistry/ Immunofluorescence - Anti-Haptoglobin antibody [HG-36] (ab13429)This image is courtesy of an anonymous Abreview. 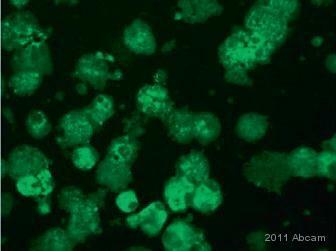 ab13429 staining Haptoglobin in human bronchoalveolar lavage cells by Immunocytochemistry/ Immunofluorescence. Cells were fixed in HOPE, blocked for 5 minutes at 25°C, then incubated with ab13429 at a 1/100 for 1 hour at 25°C. The secondary used was an Alexa-Fluor 488 conjugated goat anti-mouse polyclonal used at a 1/200 dilution. Counterstained with DAPI. 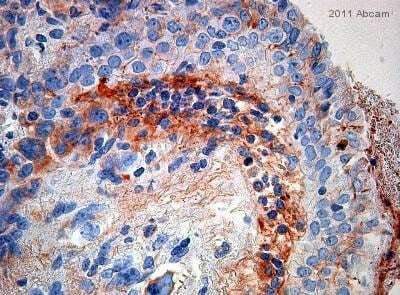 Immunohistochemistry (Formalin/PFA-fixed paraffin-embedded sections) - Anti-Haptoglobin antibody [HG-36] (ab13429)This image is courtesy of an anonymous Abreview. ab13429 staining Haptoglobin in human lung cancer tissue by Immunohistochemistry (Formalin/PFA-fixed paraffin-embedded sections). Tissue was fixed with HOPE, blocked for 5 minutes at 25°C, then incubated with ab13429 at a 1/100 dilution for 1 hour at 25°C. The secondary used was an undiluted HRP conjugated goat polyclonal. Publishing research using ab13429? Please let us know so that we can cite the reference in this datasheet. important to follow the recommendations on the datasheet." proteases could digest the antibody. Generally antibodies are stable for 1 year at 4C and for 10 years at -20C or -80C. We however recommend storing the antibodies at 4C for short term (1-2 weeks) because some antibodies lose activity if they kept at 4C for longer period of time. We unfortunately can't run stability test for each >70,000 antibody products available in catalogue. We however do experiments for checking the stability with a range of antibodies every year. The data is available on request. Based on the data we have, we choose the statement which is best suitable for all of the products. Finally, I suggest not to worry about the stability; the product is guaranteed for 6 months if stored as recommended on the datasheet. I hope this info will be helpful. refrigerated, so I don't really know how long it was not frozen. possibility the antibody could be damaged. Could you put some light on this matter? Thank you for your response and your comment. The on-line document contains general information/guidelines for our antibodies for different purifications. Each product has specific storage instructions which can be found on the public website (on-line product datasheet). This antibody can be stored at +4°C short term (1-2 weeks) but we would suggest aliquoting and keeping at -20°C or -80°C for longer period of time. If you are happy to share some further details of the IHC protocol; I could certainly take a look at it. There may be some tips/optimization I could perhaps offer if it is necessary and appropriate. It would be appreciated if you could complete the following form (attached as a word document) and attach an image to the response. I look forward to hearing from you soon and resolving this issue as soon as possible. your company and I wonder how to make dilutions of the antibody. preservative, my question is: is PBS a proper diluter? This antibody is ascitic fluid and the storage buffer contains 15mM sodium azide. You could use PBS for diluting the antibody. We have some tips/recommendations at this site, you may find it useful. Does this antibody recognize the alpha or beta chain? Thank you for your enquiry. We have not epitope mapped this antibody. The antibody recognizes the 3 haptoglobin types in ELISA, dot-blot and immunoblotting. The 3 haptoglobin types have an identical beta-chain. It is likely that the antibody recognizes the beta-chain, which is shared by the 3 haptoglobin types. However, if the alpha-chains of the 3 types share even a partial homologous sequence, that may contain the epitope recognized by the antibody. Unfortunately the antibody does not recognize a reduced molecule, therefore we were unable to locate the recognition site to any of the chains. I hope this information is useful. If you have further questions, please do not hesitate to contact us. I am looking to purchase an anti-haptoglobin antibody that reacts specifically with the alpha chain of haptoglobin. I was wondering what site do antibodies #ab13429, ab13431, ab14248 and ab8965 recognize. Thank you for your enquiry. For ab13429, the antibody recognizes human haptoglobin as the purified antigen, in human serum, when complexed with human hemoglobin or captured by antibodies. In a competitive ELISA it does not cross react with human IgG, transferrin, C-reactive protein, alpha 1 acid glycoprotein, albumin or hemoglobin, nor with bovine, goat or sheep serum. For ab14248 and ab13431, they are polyclonal antibodies and will therefore consist of a mixed population of IgGs each of which will recognise a different epitope.